Jobspotting launched in January this year with the aim of taking on the Monsters of the online recruitment world (if you see what I did there), taking a data-focused approach to matching candidates with vacancies. Now it’s launched a product to help employers discover more about the competitive recruitment landscape. The new Jobspotting analytics dashboard offers anonymized insights into job seekers’ demographics, behaviors, skills, and interests. Recruiters get a dashboard that shows the performance of their vacancies on Jobspotting, including the clicks, reach and page impressions for each. Additionally, recruiters can see details of the kinds of people checking out their vacancies , including the topics they’ve registered interests with on Jobspotting, and their locations – maybe the perfect candidates are in a city you hadn’t even considered? Recruiters can also get an overview of the competitive landscape. They can follow rival companies to see how their recruitment activity changes over time, and see how the frequency of particular types of vacancies changes. For example, maybe you want to see how the popularity of Ruby on Rails vacancies has fluctuated in Berlin over the past few months. 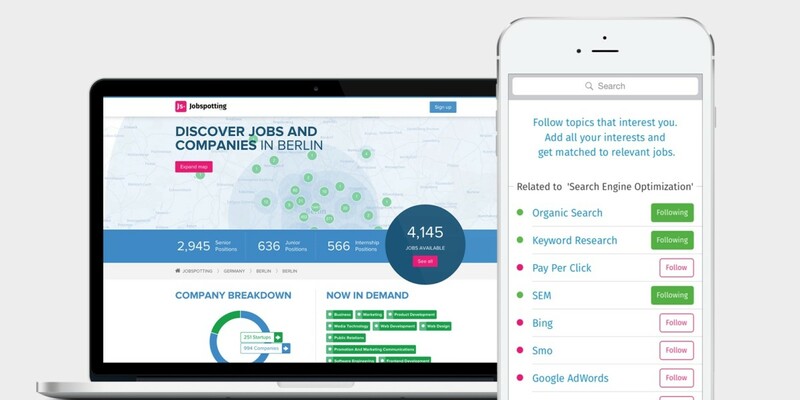 Jobspotting is doing some smart work to rethink online recruitment and employers can claim their profile to gain insights from their analytics dashboards from today. At the moment the product is free but Jobspotting will add more features and adopt a freemium business model for analytics from next year. “We already make good money from (an) affiliate business with our partners,” the company tells me.